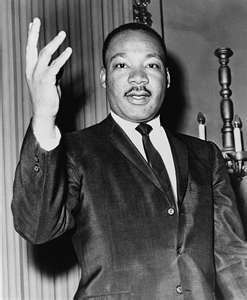 Martin Luther King, Jr. was born on January 15 which is celebrated as Martin Luther King, Jr Day the third Monday in January--Jan. 19, 2015. Teachers and homeschool parents, here are free printable lesson plans on MLK Jr., to teach children about this brave civil rights champion. First, help students relate him on a personal level with Time magazine's Jan. 15 article on what Martin Luther King Jr. was like as child. Next head to Activity Village for a printable collection of MLK Jr. activities. There are American history lessons on civil rights, bus boycotts, Selma and Montgomery marches and more. Students make text-to-self connections writing about what freedom and justice mean to them. Use these to explore Black History Month in February. Visit ABC Teach for pages for free printable Martin Luther King Jr. lesson plans in all subjects. There are assignments at different age levels on reading, writing, vocabulary, spelling, history and language arts. Print these into a homework booklet to use on in holiday lesson plans. The blog Mama Knows it All has a free printable Martin Luther King Jr. activity booklet for elementary school age children. Church House Collection has MLK Jr Day worksheets, coloring pages and crafts to print. This site has educational clipart for use in creating lesson plans, too. Henry Ford Museum, in Dearborn, Mich., has a compelling exhibit "With Liberty and Justice for All" which includes artifacts of the fight for freedom by oppressed Americans. The collection includes a "whites only" drinking fountain, Ku Klux Klan robe, the armchair President Lincoln was shot in and the actual bus Rosa Parks sat in and refused to give up her seat. Explore the exhibit online and download and print free educator resources and student activity guides on slavery, civil rights and the African American experience. There are film clips, images, artifacts, games, puzzles, worksheets and interactive activities.